Lulus Exclusive! 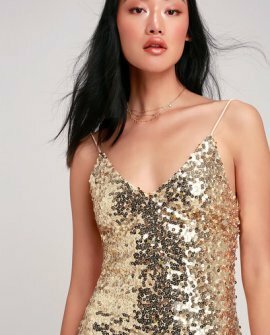 Take the party by storm in the Lulus Force of Fashion Gold Backless Sequin Mini Dress! Mesh overlay, decorated with shimmering gold sequins, falls from rounded, elastic straps, into a darted, triangle bodice. Strappy, open back tops a figure-skimming mini skirt.